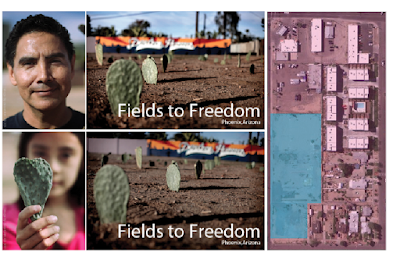 The Fields to Freedom project in downtown Phoenix is a participatory art project transforming vacant space of urban blight with art, community and ecology. Through a mass cactus planting performance, a landscape installation is created, the first phase of the urban desert pop-up park. This park and garden reacquaints residents to native Sonoran desert ecologies, while maintaining and reinforcing sustainable desert agricultural and culinary practices. This project exists as a sight specific installation and in the gallery setting as photography and video. Land installation, Performance, participatory, photography, video, 2011.